I am a big fan of superhero TV shows. I am currently watching every single superhero show on TV right now, except Gotham (seriously that show is garbage). So far nearly all of them have something going for them that is worth the slog through their many terrible episodes. 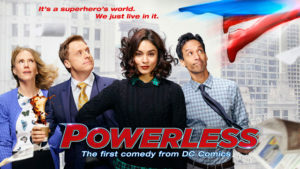 As a fan of this genre, I was excited when NBC announced their plans for a comedy based on the lives of the every-man living in a world of superheroes and supervillains. Originally rumored to be in the setting of an insurance company specializing in super-collateral damage, it was later confirmed to be a show about a research and development firm owned by Bruce Wayne and specializing in technology used by every day men and women to protect themselves from the damage caused by heroes and villains as they fought.